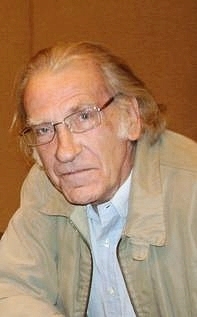 David Warner is an English actor who is known for playing both romantic leads and sinister or villainous characters, across a range of media, including film, animation, television, and video games. Over the course of his long career he is most famous for his roles in films such as Tom Jones, A Midsummer Night's Dream, Cross of Iron, Madhouse on Castle Street, Morgan: A Suitable Case for Treatment, Little Malcolm, The Omen, The Island, Time Bandits, Tron, The Company of Wolves, Star Trek V: The Final Frontier, Star Trek VI: The Undiscovered Country, The Lost World, Titanic and Planet of the Apes. Warner was born in Manchester, Lancashire, England, the son of Doreen (née Hattersley) and Herbert Simon Warner, who was a nursing home proprietor. He was born out of wedlock and frequently taken to be brought up by each of his parents, eventually settling with his Russian Jewish father and his stepmother. He was educated at Feldon School, Leamington Spa, Warwickshire and trained for the stage at the Royal Academy of Dramatic Art , London. Warner made his professional stage debut at the Royal Court Theatre in January 1962, playing Snout, a minor role in Shakespeare's A Midsummer Night's Dream, directed by Tony Richardson for the English Stage Company. In March 1962 at the Belgrade Theatre, Coventry he played Conrad in Much Ado About Nothing, following which in June he appeared as Jim in Afore Night Come at the New Arts Theatre in London. He joined the Royal Shakespeare Company in Stratford-upon-Avon in April 1963 to play Trinculo in The Tempest and Cinna the Poet in Julius Caesar, and in July was cast as Henry VI in the John Barton adaptation of Henry VI, Parts I, II and III, which comprised the first two plays from The Wars of the Roses trilogy. At the Aldwych Theatre, London, in January 1964, he again played Henry VI in the complete The Wars of the Roses history cycle . Returning to Stratford in April he performed the title role in Richard II, Mouldy in Henry IV, Part 1 and Henry VI. At the Aldwych in October 1964, he was cast as Valentine Brose in the play Eh? by Henry Livings, a role he reprised in the 1968 film adaptation Work Is a Four-Letter Word. He first played the title role in Hamlet at the Royal Shakespeare Theatre in the 1965 repertoire. This production was transferred to the Aldwych Theatre in December of that year. In the 1966 Stratford season, his Hamlet was revived and he also played Sir Andrew Aguecheek in Twelfth Night. Finally at the Aldwych in January 1970, he played Julian in Tiny Alice. According to his 2007 programme CV, Warner's other work for the theatre has included The Great Exhibition at Hampstead Theatre ; I, Claudius at the Queen's Theatre ; A Feast of Snails at the Lyric Theatre ; Where There's a Will at the Theatre Royal, Bath; King Lear at Chichester Festival Theatre ; and also Major Barbara on Broadway. In 1963, he made his film debut as the villainous Blifil in Tom Jones, and in 1965, starred as Henry VI in the BBC television version of the RSC's The Wars of the Roses cycle of Shakespeare's history plays. Another early television role came when he starred alongside Bob Dylan in the 1963 play Madhouse on Castle Street. A major step in his career was the leading role in Morgan: A Suitable Case for Treatment opposite Vanessa Redgrave, which established his reputation for playing slightly off-the-wall characters. He also appeared as Konstantin Treplev in Sidney Lumet's 1968 adaptation of Anton Chekhov's The Sea Gull and starred alongside Jason Robards and Stella Stevens as Reverend Joshua Duncan Sloane in Sam Peckinpah's The Ballad of Cable Hogue. In horror films he appeared in one of the stories of From Beyond the Grave, opposite Gregory Peck in The Omen as the ill-fated photojournalist Keith Jennings, and the 1979 thriller Nightwing. He also starred in cult classic Waxwork , and featured alongside a young Viggo Mortensen in 1990 film Tripwire. He has often played villains, in films such as The Thirty Nine Steps , Time After Time , Time Bandits , Tron , Hanna's War , and television series such as Batman: The Animated Series playing Ra's al Ghul, the anti-mutant scientist Herbert Landon in Spider-Man: The Animated Series, as well as rogue agent Alpha in the animated Men in Black series and the Archmage in Disney's Gargoyles and finally The Lobe in Freakazoid. He was also cast against type as Henry Niles in Straw Dogs and as Bob Cratchit in the 1984 telefilm A Christmas Carol starring George C. Scott as Scrooge. In addition, he played German SS General Reinhard Heydrich both in the film Hitler's SS: Portrait in Evil, and the television miniseries Holocaust; as sinister millionaire recluse Amos Hackshaw in HBO's original 1991 film Cast A Deadly Spell, who plots to use the world's most powerful spell book – the Necronomicon – to unleash the Lovecraftian Old Ones from eternal imprisonment upon the Earth. Warner was considered for the role of Freddy Krueger in A Nightmare on Elm Street after producers were impressed with his performance as Jack the Ripper in Time After Time but had to turn it down due to scheduling conflicts. He subsequently appeared in movies such as Star Trek V: The Final Frontier , Star Trek VI: The Undiscovered Country, Avatar, Teenage Mutant Ninja Turtles II: The Secret of the Ooze , Titanic and Scream 2. In 2001 he played Captain James Sawyer in two episodes of A&E's adaptation of CS Forester's Hornblower series. He appeared in three episodes of the second season of Twin Peaks . He also continues to play classical roles. In "Chain of Command", a 6th-season episode of Star Trek: The Next Generation, he was a Cardassian interrogator. He based his portrayal on the evil "re-educator" from 1984. His less-spectacular roles included a double-role in the low-budget fantasy Quest of the Delta Knights which was eventually spoofed on Mystery Science Theater 3000. He also played Admiral Tolwyn in the movie version of Wing Commander. Warner's sympathetic side had been evident in Sam Peckinpah's Cross of Iron , where he portrayed Capt. Kiesel. Other "nice guy" roles include the charismatic "Aldous Gajic" in "Grail", a first season episode of Babylon 5 and "Chancellor Gorkon" in Star Trek VI: The Undiscovered Country . In an episode of Lois & Clark: The New Adventures of Superman he played Superman's deceased Kryptonian father Jor-El, who appeared to his son through holographic recordings. Warner has also played "ambiguous nice guys" such as vampire bat exterminator Philip Payne in 1979's Nightwing; and Dr. Richard Madden in 1994's Necronomicon: Book of the Dead. In Seven Servants he co-starred with Anthony Quinn in 1996. Warner contributed "Sonnet 25" to the 2002 compilation album, When Love Speaks , which consists of Shakespearean sonnets and play excerpts as interpreted by famous actors and musicians. He has performed in many audio plays, starring in the Doctor Who "Unbound" play Sympathy for the Devil as an alternative version of the Doctor, and in a series of plays based on ITV's Sapphire & Steel as Steel, both for Big Finish Productions. He reprised his incarnation of the Doctor in a sequel, Masters of War . In 2007, he guest starred as Isaac Newton in the Doctor Who audio drama Circular Time. He also guest starred in the BBC Radio 4 science-fiction comedy Nebulous as Professor Nebulous' arch-enemy Dr. Joseph Klench. In all these productions, Warner has worked with writer and comedian Mark Gatiss of the League of Gentlemen, and plays a guest role in the League's 2005 feature film The League of Gentlemen's Apocalypse. He has also performed in radio plays for the distinguished American companies L.A. Theatre Works and The Hollywood Theater of the Ear. In 2005, Warner read a new adaptation of Oliver Twist for BBC Radio 2 . In 2008, he guest-starred as Mycroft Holmes in the Bernice Summerfield audio play The Adventure of the Diogenes Damsel. In 2009, he was the voice of Lord Azlok of the Viperox, an insectoid alien race in the animated Doctor Who serial "Dreamland". Warner also did voice work on the short-lived FOX animated show Toonsylvania as Dr. Vic Frankenstein. On the Cartoon Network animated television series The Grim Adventures of Billy and Mandy, David provided the voice of Nergal, a demonic creature from the Earth's core. He voiced the character until 2003, when he was replaced by Martin Jarvis. He also voiced one of Batman's greater enemies, Ra's Al Ghul, in Batman: The Animated Series, Superman: The Animated Series, and an episode of Batman Beyond. He also voiced the Lobe in Freakazoid and Alpha in Men in Black: The Series. Warner narrated the Disney's direct-to-video Pooh's Grand Adventure: The Search for Christopher Robin. In May 2005, at the Chichester Festival Theatre Warner made a return to Shakespeare, playing the title role in Steven Pimlott's production of King Lear. Tim Walker, reviewing the performance in the Sunday Telegraph, wrote: "Warner is physically the least imposing king I have ever seen, but his slight, gaunt body serves also to accentuate the vulnerability the part requires. So, too, does the fact that he is older by decades than most of the other members of the youthful cast." On 30 October 2005, he appeared on stage at the Old Vic theatre in London in the one-night play Night Sky alongside Christopher Eccleston, Bruno Langley, Navin Chowdhry, Saffron Burrows and David Baddiel. In December 2006, he starred in Terry Pratchett's Hogfather on Sky1 as Lord Downey. And in August 2007, as an RSC Honorary Artist, he returned to Stratford for the first time in over 40 years to play Sir John Falstaff in the Courtyard Theatre revival of Henry IV, Part 1 and Henry IV, Part 2 which were part of the RSC Histories Cycle – making him the only British actor to have played Hamlet, Lear and Falstaff in major theatrical productions. In February 2008, Warner was heard as the popular fictional character Hugo Rune in a new 13-part audio adaptation of Robert Rankin's The Brightonomicon released by Hokus Bloke Productions and BBC Audiobooks. He starred alongside some high profile names including cult science fiction actress and Superman star Sarah Douglas, Rupert Degas, Lord of the Rings actor Andy Serkis, Harry Potter villain Jason Isaacs, Mark Wing-Davey and Martin Jarvis (written by Elliott Stein & Neil Gardner, and produced/directed by Neil Gardner). In 2010, writer and actor Mark Gatiss interviewed Warner about his role in The Omen for his BBC documentary series A History of Horror. Whole or part of the information contained in this card come from the Wikipedia article "David Warner", licensed under CC-BY-SA full list of contributors here.